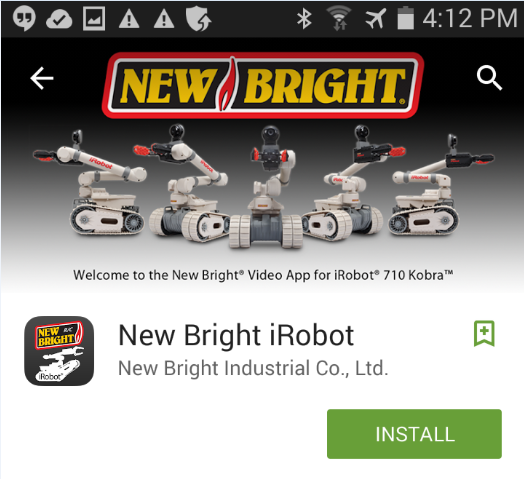 R/C 710 Kobra - Frequently Asked Questions | New Bright Industrial Co.
How do I connect my Kobra robot to my Android-based device? 3. 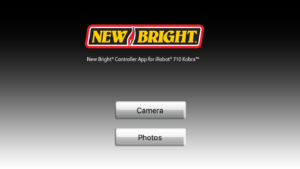 Install New Bright iRobot App; App is free to download. 4. 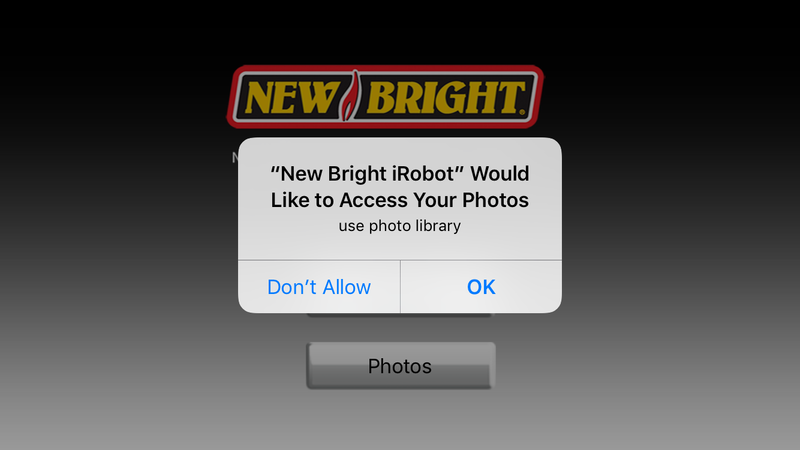 When prompted, ACCEPT permissions. 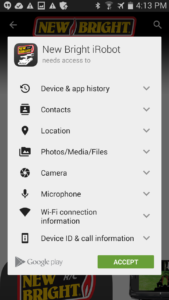 Without these permissions, your app will not function as intended. 6. 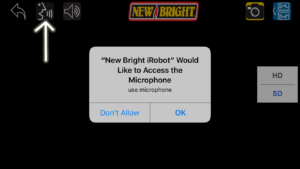 Press the right BLUE button on your transmitter to initiate your robot's WiFi signal. 7. Listen for series of beeps; your robot will beep several times, a quick 3-beep indicates your WiFi is active. This process can take up to 30 seconds. 8. Open the WiFi settings on your Android device; Select signal "MV#######" These numbers will match those found on the back of your robot's camera. How do I connect my Kobra robot to my iOS-based device? 3. Download/Install App, App is free to download. 5. 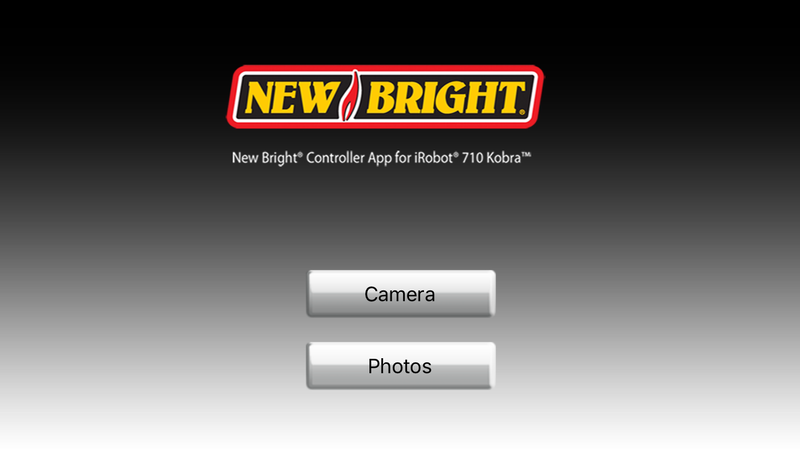 Press the right BLUE button on your transmitter to initiate your robot's WiFi signal. 6. 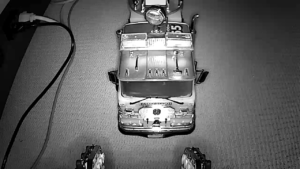 Listen for series of beeps; your robot will beep several times, a quick 3-beep indicates your WiFi is active. 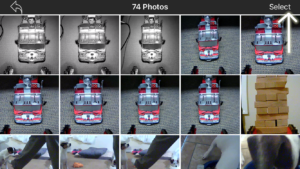 This process can take up to 30 seconds. 7. 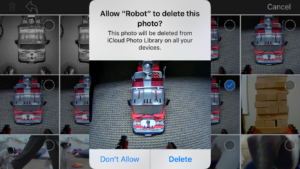 Open the WiFi settings on your iOS device; Select signal "MV#######" These numbers will match those found on the back of your robot's camera. 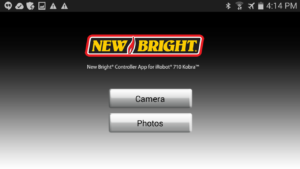 Do I need a iOS/Android smart device in order to operate my Kobra robot? No. 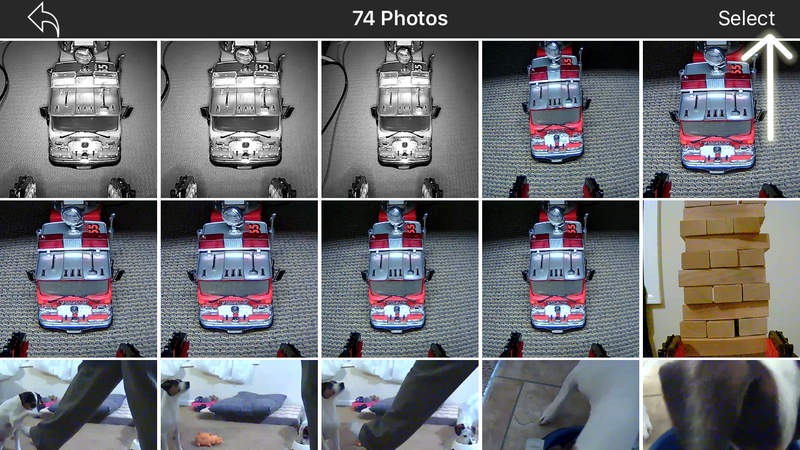 You would only need an iOS/Android smart device in order to operate the functions of the robot's on-board camera. Will the Kobra robot app work on my device? 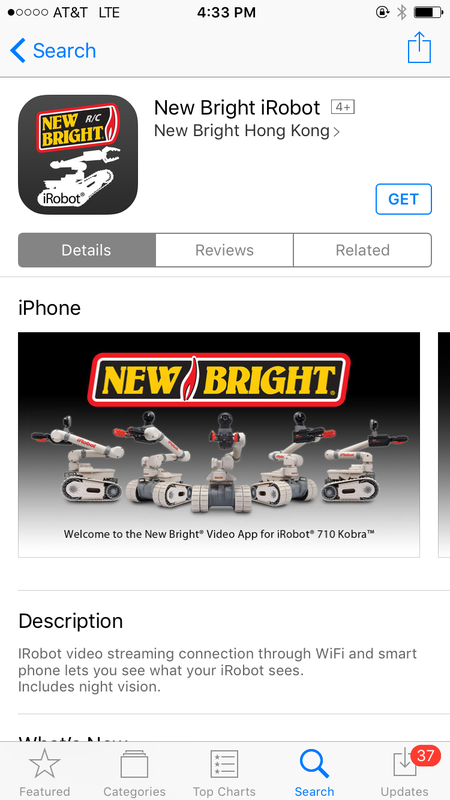 If you using an iOS (optimized for iOS 6.0 or later), or Android powered device capable of accessing and downloading apps from either the Apple Store or Google Play Store, you should be able to run the Kobra app. 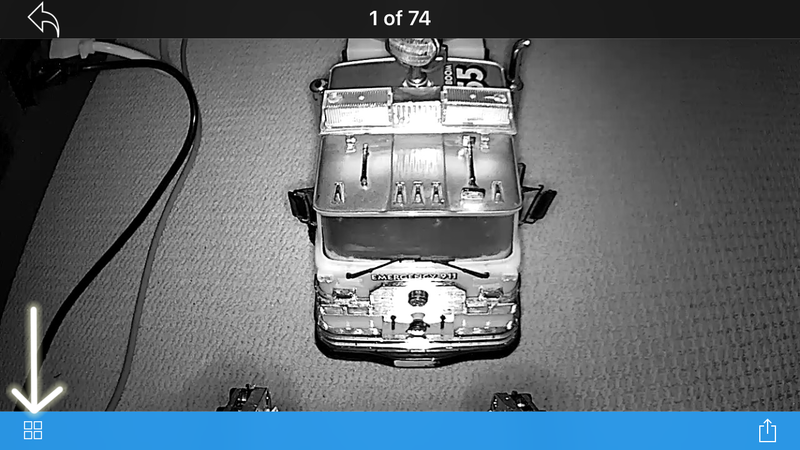 I have the Kobra App open, why won't the camera view connect? 1. 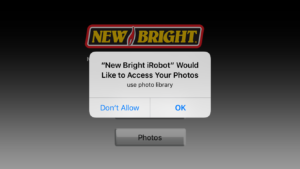 You must directly connect to the robot's WiFi signal from your smart device. 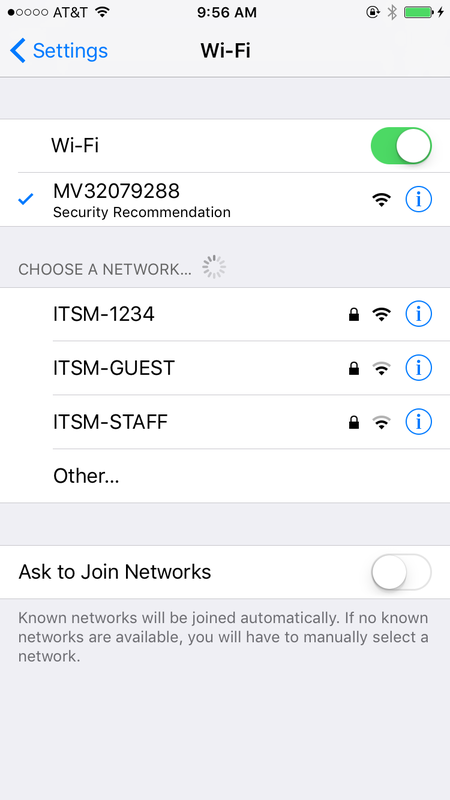 You achieve connection through the WiFi settings on your phone. 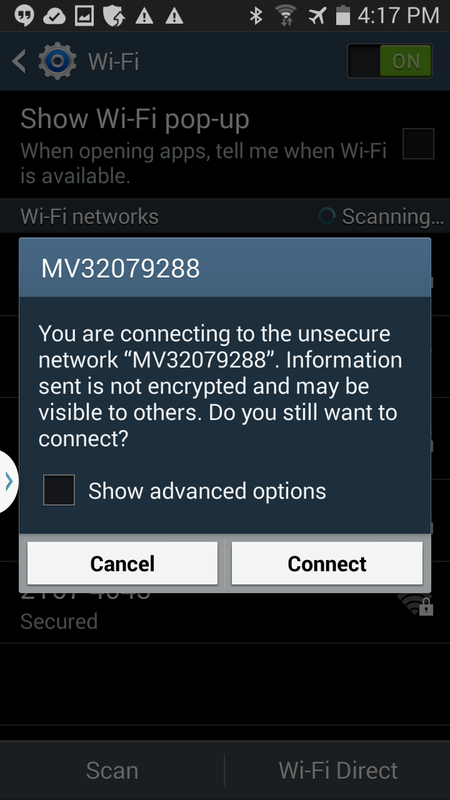 For further assistance, please follow steps outlined for your type of device on this page. 2. 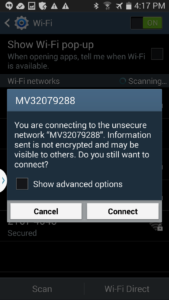 Already connected, but still not seeing anything? Check to ensure you have enabled all necessary permissions for the app in your device's app settings. 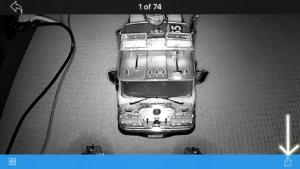 Can I access my robot remotely through a router? No, you must directly connect to the robot's WiFi signal from your smart device, through your device's WiFi settings. 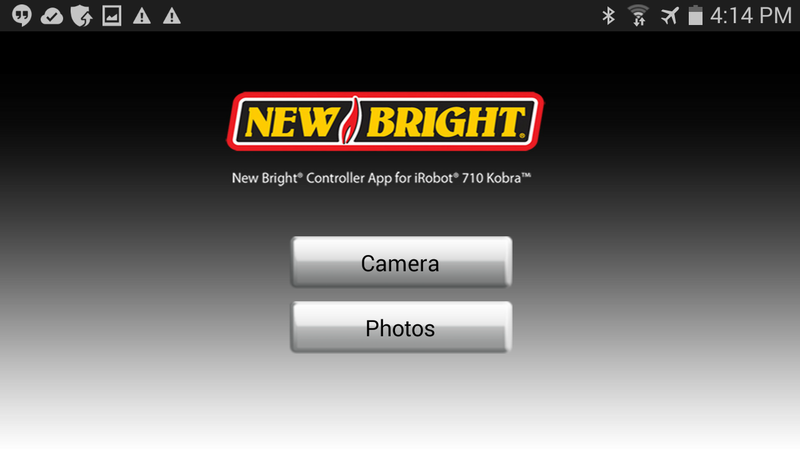 Can I operate my Kobra robot arm and movements using only my phone/tablet? No. At this time, the app controls the use of the camera, streaming video and walkie-talkie functions. 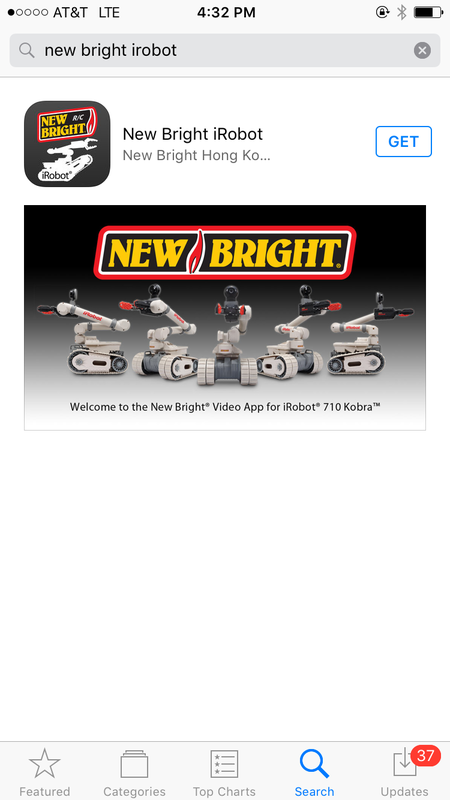 Where can I find a digital copy of the 710 Kobra Owner's Manual? 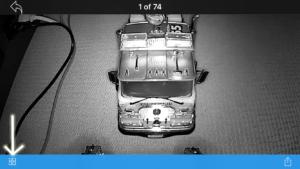 What does the night vision view look like? 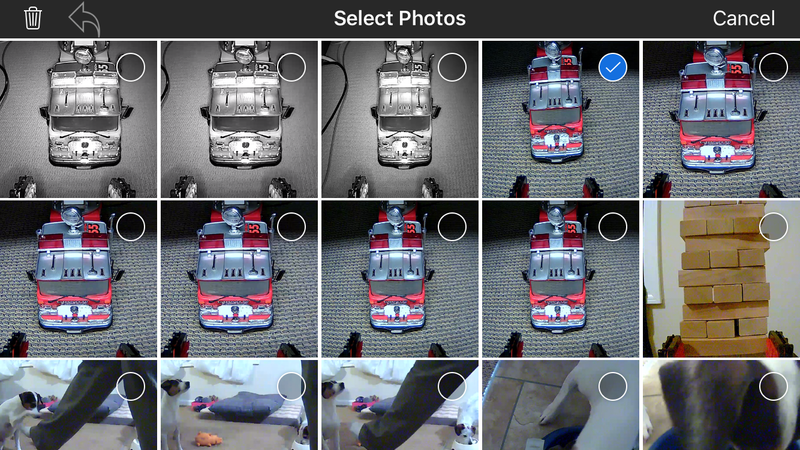 How do I review/delete my photos inside the App? 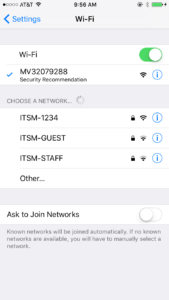 iOS/Apple Devices? 7. 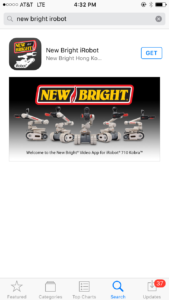 To return to App home screen, tap back arrow symbol at top left of screen from gallery view. How much weight is the Kobra able pick up? 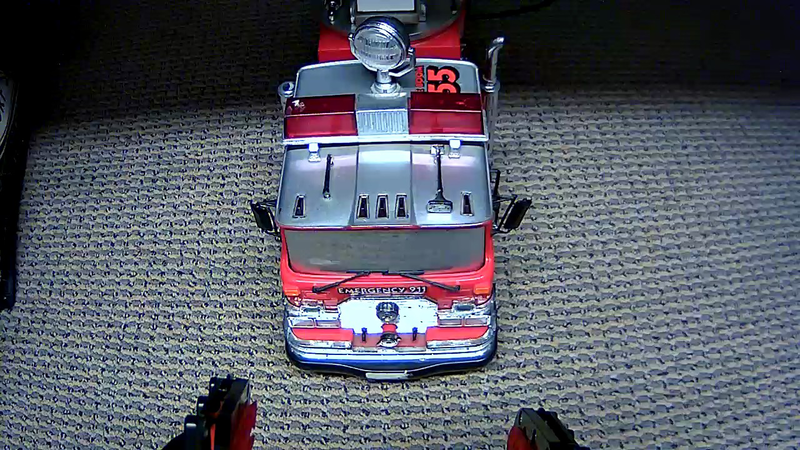 The arm is rated to pick up 6 ounces of weight; this is noted on the robot's arm. Why does my robot's claw click? 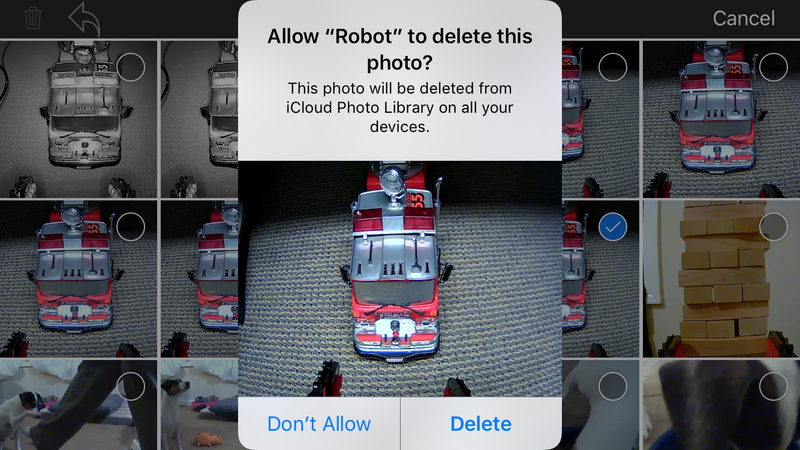 If your robot's claw clicks, this indicates that your claw has been closed to its limit. Continuing to allow the claw to click will likely result in stripping of the internal gearing, rendering your claw unable to be used for future tasks. 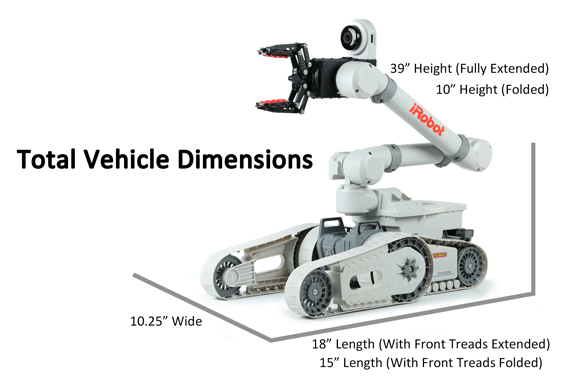 What are the dimensions of the Kobra robot?